Like most young men, I learned to shave when I was barely a teenager. It was something I watched my Dad do growing up and I thought it had to be the manliest thing I had ever seen, so naturally I wanted to start doing it myself the split second I first noticed a couple patches of peach fuzz growing on the outer edges of my cheeks. I learned to do it exactly how Dad did it my whole life: pour a sink full of water, squirt the shaving gel into the palm of your hand out of the tube with the giant button on top, make it foamy by clapping your hands a few times, then slather it on your face until there is complete coverage. From there, stick a cartridge on top of your razor handle and go to town until the hair is gone. But I noticed a peculiar thing in those early days, and it only got weirder the older I got. You see, Dad swore by his Gillette Mach 3 Turbo razor, with its odd combination of metal and rubber in the handle, and a cartridge made up of three simple razor blades in an array nestled inside a plastic enclosure. But the odd thing was that only one specific type of cartridge would fit the handle, and that cartridge was made exclusively by Gillette. Not only did they sell you the handle, but if you wanted to keep using it you had to come back to them for the blades. And man alive, were those cartridges not cheap. I could measure inflation over the years based on Dad’s complaints that a pack of razor blades was now $5, or $10, or even $15 (the current going rate for a 5 pack of cartridges at Walmart). I’m amazed that despite people’s crusades against DRM in Keurig cofee pods, and cyberpunk revolutions against DRM in tractors in which farmers are flashing Ukranian firmware on their farm equipment, people aren’t more up in arms about this obvious and awful attempt by corporations to hold your shaving experience hostage. Because here’s the truth that these companies don’t want you to know: there is a standardized, DRM-free, superior option out there for way cheaper than the cartridges that these companies are artificially marking up. How cheap? I’m talking 9.7 cents per blade cheap. Fast-forward to last year, when I naively decided that I was going to improve my shaving experience by sampling Harry’s line of shaving products. I decided to get the Winston set, the razor handle that is made of die-cast zinc and polished chrome, along with 3 razor blades, and a 3.4 oz tube of shaving cream. This set could be mine for $25. Not bad, certainly. But I also needed some post-shave balm ($8 for 3.4 oz), and I figured since I was splurging on a high quality shaving experience, I owed it to myself to get the aluminum stand ($15) to proudly store and display my razor when not in use. And just like that, I was in business for only $48. When I opened the box I held the razor handle in my hand. Immediately I was unimpressed with how it felt to hold. There wasn’t anything wrong with it, but it wasn’t nearly as heavy as I thought it ought to be. Then I tried placing it in its stand. I thought the stand would be uniquely made to perfectly hold the razor and display it elegantly at a perfect angle. Instead I found a pathetic, boring block of run-of-the-mill aluminum with a giant hole drilled in the middle. The razor didn’t fit in it so much as awkwardly jiggled around. 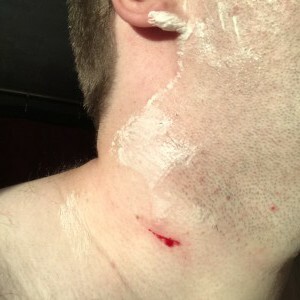 And then, when it came time to actually take the razor cartridge for a test spin, I found that I got a pretty good shave, but the fives blades (plus precision trimmer) felt kind of like a cat licking my face. All in all, a pretty disappointing experience. 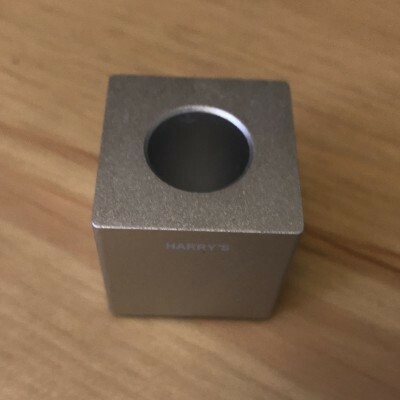 And just like the razor I had grown up with, this too had a special cartridge requirement: it would only work with Harry’s cartridges, which were $2 a pop — as long as you got at least an 8 pack when you ordered. And of course the tube of shaving cream would go pretty fast, and a replacement $3.4 oz tube is $8. 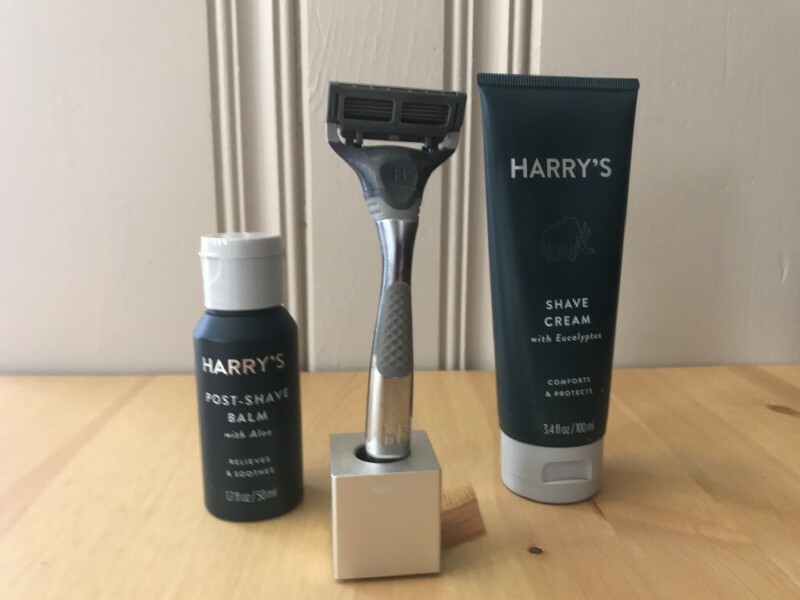 Now you don’t have to get the shaving cream from Harry’s, but if you’re buying the blades and there’s a minimum requirement for free shipping, why in the world would you not? And thus began an obsessive year-long exploration of the wonderful world of wet shaving. The great thing about wet shaving is that there are many different types of tools and methods to use (and you never get locked into any particular one of them), but for the sake of argument I’m going to focus on the most popular (and the one I use): a double-edged safety razor and a tub (canister?) of shaving soap. You guys. This is not just shaving. This is an experience. This is a way of life. Working up a nice hot lather, gently massaging it onto your face, making deliberate and effective strokes to trim the hair from your face, and following up with a lovely towel pat and post-shave balm. Holy moly. If you’re not familiar with it, this guy on YouTube is the one to learn from. Ignore the moments where he mentions a particular product he’s selling, and focus only on the information he is giving you. This guy is a master. He’s Scottish, he’s masculine, and he’s no-nonsense. He’s the best. And yes, you will have difficulties along the way. It takes some time to master. There is a technique and a method to the madness. You will probably bleed a bit. And wowzer, do the big cuts hurt. But when you come close to mastering it, there’s nothing that can compete with it. And best of all, there is no DRM, there is no vendor lock-in, and the blades and supplies are relatively inexpensive. So let’s work out some math here. We’ll focus on the traditional cartridge-based razor. Let’s say a cartridge lasts a solid month. I need 12 for a whole year. Let’s also say that a tube of shaving cream lasts 3 months. It was a $48 initial investment, with 3 cartridges and a tube of shaving cream. I’ll need 3 more tubes of cream, at $8 each, so that’s an extra $32. Plus an 8 pack of razors which will get me to 11 (close enough to 12), so that comes to $40. $88 altogether for my first year of shaving using Harry’s. Now to be fair, there is a completely plastic razor that’s $10 cheaper, the $15 stand is simply not worth it, and you can knock off $8 for the post-shave balm if you’re in dire straits, but really you shouldn’t. So $88 for the advanced experience, $55 if you’re going cheap. Let’s compare that to a double-edged straight razor. $16.95 for the stainless steel razor handle and razor head. And no matter which razor you end up going with, it’s a fair bet that it will be with you forever. Your grandchildren will be using it long after you’ve turned to dust. If you use a new razor blade once every two weeks, you need 26 razors to make it through the year. A pack of blades is $1 for 5, or $0.20 per blade. Astra’s are the finest blades in the world, but they are aggressive, so try different brands (so far the Shark brand is actually my favorite). If you decide you do like the Astra blades, grab the 100 pack for $9.73, or $0.09 cents per blade. If you want to cover the next decade’s worth of shaves, get the 400 pack for 8 cents per bade. So $5.20 per year if you buy them 5 at a time (or half that if you get the 100 pack). Then let’s add on the accessories. $14.99 for a shave brush. $12.95 for a tub of shave soap that will last all year. 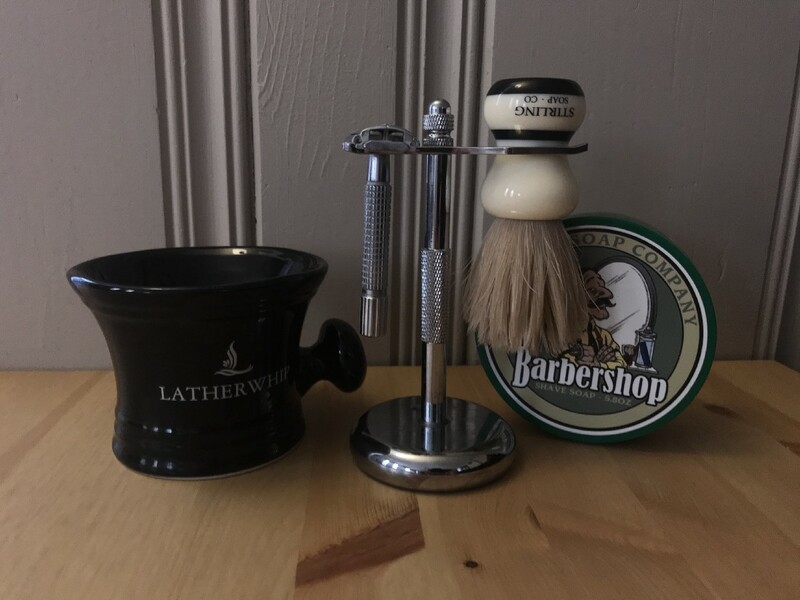 And finally, if you’re fancy, $17 for a razor and brush stand (designed to perfectly display both your razor and brush), and $19.97 for a totally bitchin’ lathering mug. All that comes out to $87.06 for the Rolls-Royce of shaving experiences. But really, for a razor and a year’s worth of blades, it’s $21.95. So going for the luxurious options, the two methods are roughly equal that first year. But then, with initial costs out of the way, let’s compare another year. The 8 pack of Harry’s cartridges won’t cut it, so you’ll have to get the 16 pack for $30. Then four tubes of shaving cream at $8, which comes to $32. $62 for a year of shaving with Harry’s. Compare that to $2.53 for 26 blades (out of the 100 pack), and a $12.95 tub of shaving soap. Just $15.48 for a year of shaving. Plus, you’re not locked in to a single brand of razors. You can shop around, mix and match, and go nuts. So go forth, world, and pamper yourself (in a masculine way) with a DRM free shaving experience like you’ve never imagined.